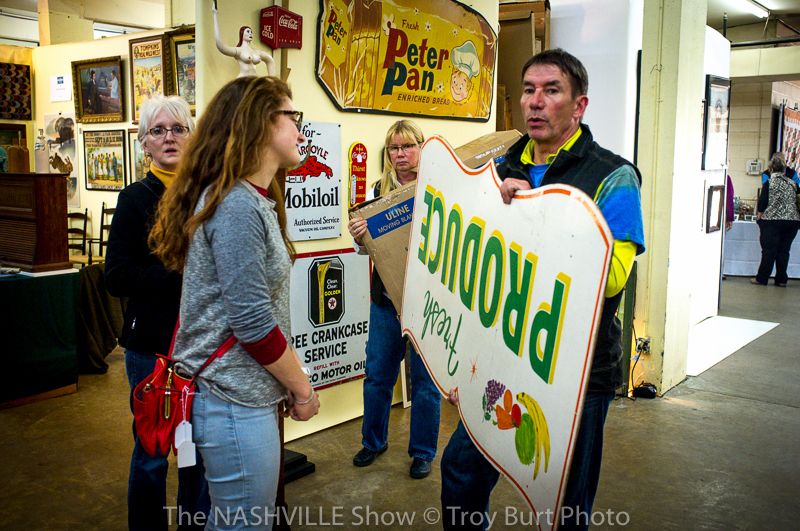 The 2016 Springfield Antique Show and Flea Market Extravaganzas are almost upon us and given this is the 47th year, you better believe it, they are real, they are spectacular, and they are growing! This year marks a milestone for a record number of vendors, it’s amazing to see how far this whole event has grown. At last count we had at least 100 more vendors than we did in any previous year and that number is still growing! If you stop and think about it, one hundred plus more vendors in an event that already houses two thousand. Imagine your typical county flea market on a good sunny day, it houses around seventy-five maybe a hundred vendors—on a really good, sunny, specular day. Think of the stuff you find and how much fun you have. Then, imagine adding that to an event that already pretty much has all that! That’s what we have to look forward to next week! I woke up this morning and my social media feed was full of excited vendors posting pictures of awesome wares. 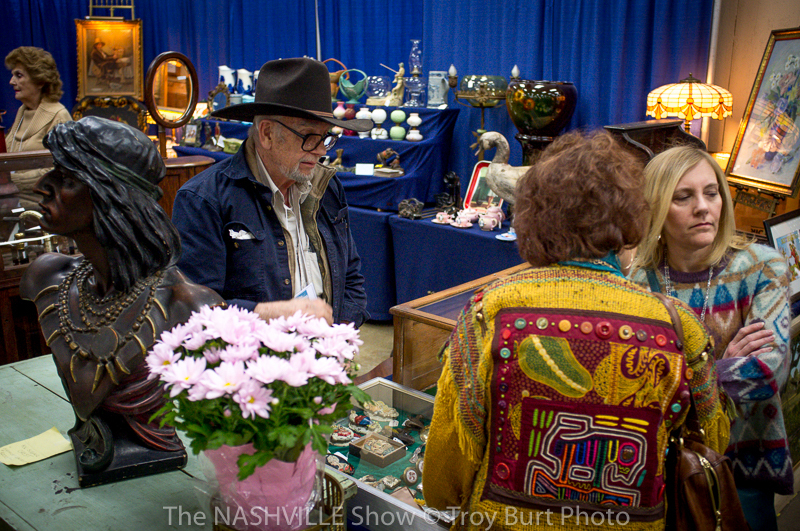 I personally noted two items that I laughingly thought, “Man, I want to try and find those vendors!” The sarcastic proverbial “Laugh Out Loud” because me with a pocketful of money in a sea of affordable, quality antiques and collectibles trying to make my way to find just one or two items is like me at the Extravaganza trying to make my way across a sea of vendors trying to find one or two items. I’ll be pockets out in two booths, thankfully I’m a vendor and can sell to go and buy. I guess my point here is everyone is totally amped up for this and ready for what’s about to unfold. From this point on I want to give you a true preview of the 2016 Springfield Antique Show and Flea Market Extravaganzas using these vendor posts and the stuff they have on their sites. I can say, “Oh this is going to be awesome,” and earn my contracted writer’s pittance with say two or three more paragraphs of actual and honest praise for what I’m seeing, but the limiting nature of my overtly uncritical, portly yet facetiously primitive and descriptive minor soliloquy remains illiquid in this way. I like to think of what I just wrote as “We can’t run without doing a couple flips and cartwheels first,” so let’s get with the photos. This is the piece I would swim the Extravaganza for. Swoon…little drawers, it’s wood too. Nice piece and I have no doubt it will sell! Amazing wares, this would make an excellent monitor stand or simple coffee table. I always want to buy pieces like this! 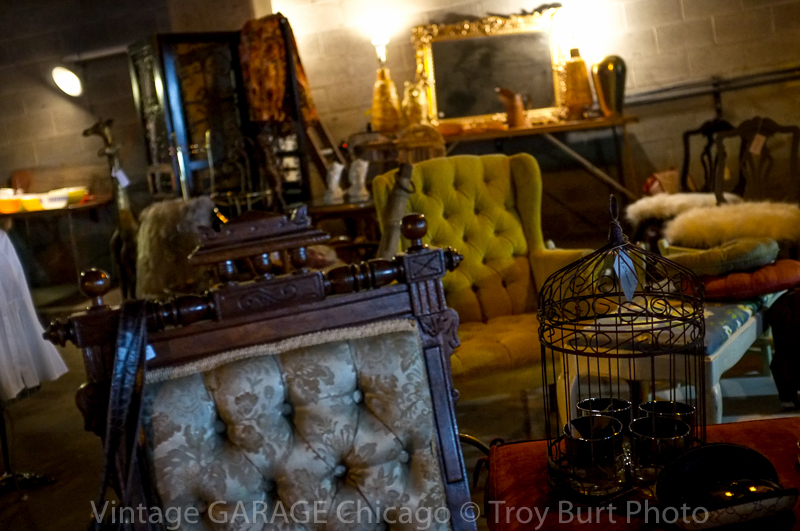 The classical nature of the Extravaganzas, true vintage markets and items like antiques, collectibles, artisan wares etc. are what makes them so appealing to customers! The most exciting part aside from the food and live music (I’ll cover that shortly) is the best of the best stuff is here. I write “antiques and collectibles” but that glazes it over. What I’m really referring to is stuff you only find at this show. The stuff vendors have been setting back all year long, “Set that back for the Extravaganza.” I must have said that a hundred times. 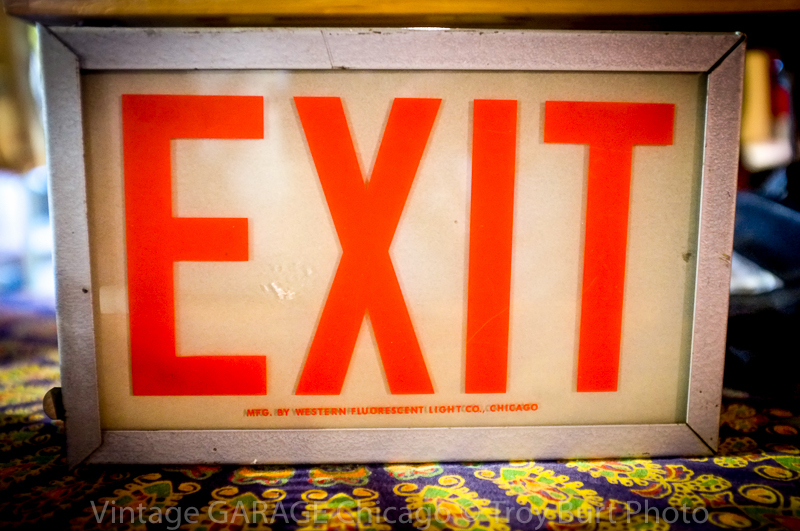 I have boxes labeled “Springfield Antique Show and Flea Market Extravaganza” kind of, that are deep with amazing stuff. I like to think of this as a collector’s paradise. As a child of the 80’s I gloss over (about every day or so) at what I hope to find in the way of vintage Star Wars…gurgle, gurgle. Gas and oil, advertising, neon, bright, silver, shiny, robots, glass, tools, toys, tins, sports stuff, the next sentence covers other things like old crusty barn finds, fresh, I mean fresh dirt on stuff, project stuff like old windows, architectural salvage, cabinets with pigeon holes, white chippy everything. 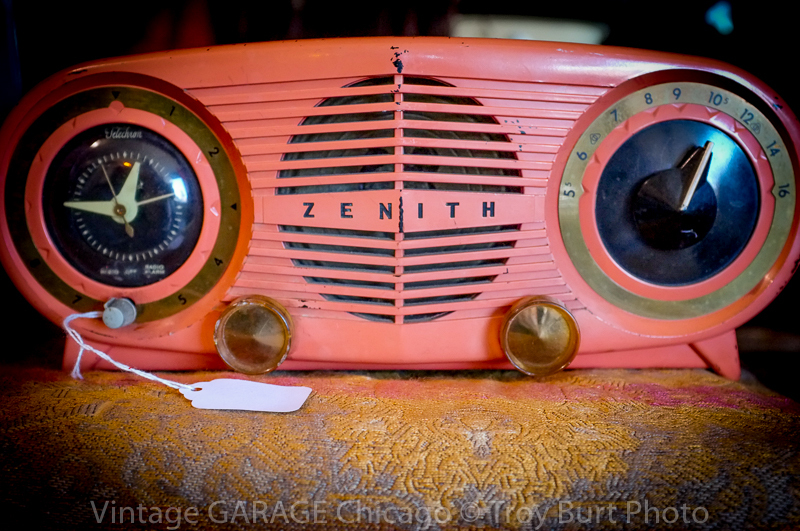 Or say you’re into vinyl, vintage radios, televisions, rocket ships, midcentury modern, or vintage fire and police, postal, bicycles old and new, airplanes, vintage monsters, medical, oddities, musical instruments, lightning rods. This is not a listing of like the best garage sale ever. This is really going to happen and you really can go! I also like that vendors bring multiples of the same thing. Rest assured there will be piles of wooden boxes, wire baskets, flower pots and gardening stuff of all kinds, flowers and plants included, windows like these pictured above and the whole gamete of vintage, primitive decorator stuff you see on Pinterest and all the trendy magazines! Linda S writes, “Spaces 674&675 across from the dog barn.” Look at all those wagon wheels! We love multiples! Thanks Linda for sharing this! Dianna A writes, “We will be in the sheep arena!” Everything in this pictures is something awesome! Little drawers, wood tool tote, “Toto”. 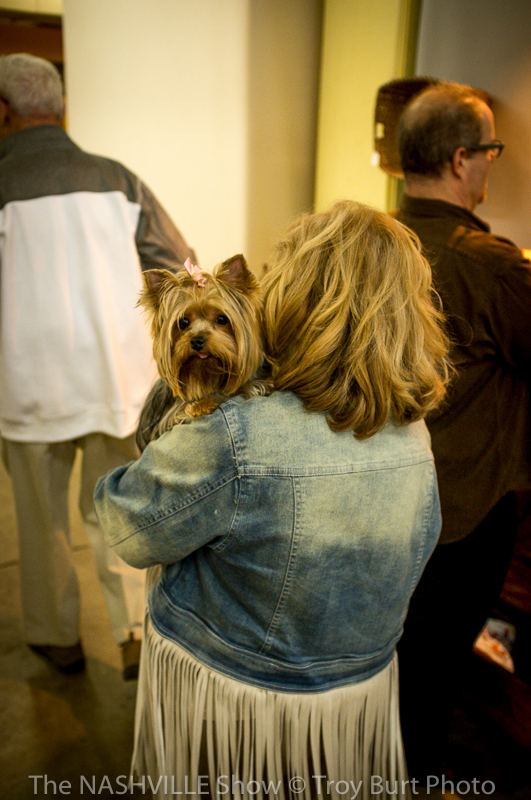 I should mention we are pet as well as kid and extended family friendly! Bring that mother-in-law! Clifford L. writes, “We will again be at the Extravaganza. Look for us in the Mercantile Building. Wow! Thank you to ‘Allure Magazine’ for featuring J.R. Watkins Sugar and Shea Body Scrub as a favorite All-Natural product on the ‘Today Show’s Tamron’s Tuesday Trend’!! Try Watkins as a Natural Deodorant in Coconut Milk & Honey, Grapefruit, Lavender, Lemon Cream, and Pomegranate & Acai. Thanks again ‘Today Show’ for including J.R. Watkins in your New Brand Showcase. 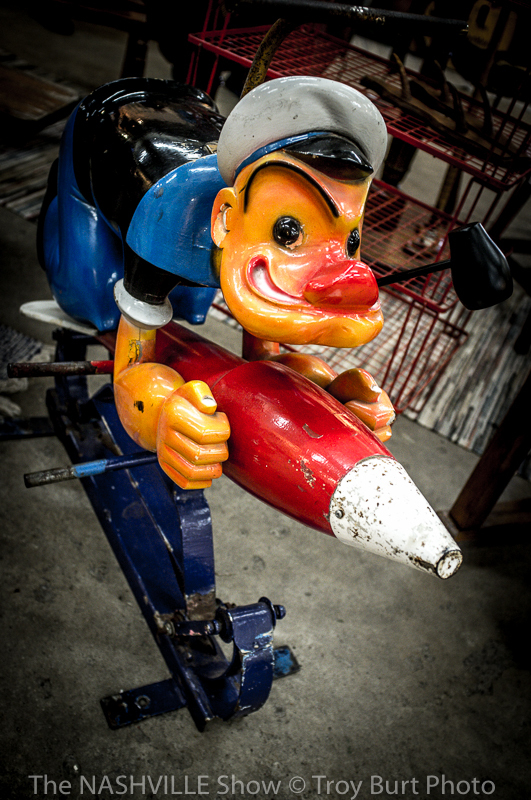 This is just a small sample of the kinds of stuff you will find at the 2016 Springfield Antique Show and Flea Market. Aside from all the cool stuff to buy there will also be live music and tons and tons of food and activity including but not limited to ice cream, soda pop, beer, fried stuff, and ice cream. Many of the vendors plan for the Extravaganza the whole year. The quality of wares and overall prices are hard to beat. This is a top, national show and everything you come to expect with something this huge be there. Remember, this will be the biggest turn out yet! 2100 plus vendors (list is growing daily) and 20,000 in attendance, the 2016 Springfield Antique Show and Flea Market will be one for the books! Visit and like the Facebook page for updates as well as the Show News page right here! Remember to tell your friends! 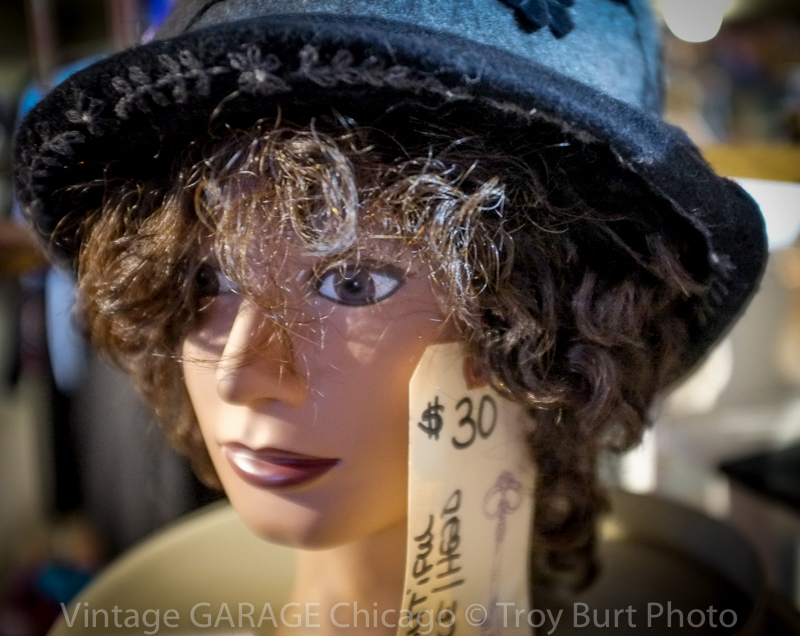 Springfield Antique Show and Flea Market Extravaganzas (x2) Real and Spectacular! In the age of the Internet you can pretty much do and say anything you want. You can say your car is “the best”, your food is “organic”, your jewelry is “genuine”, and to some degree some of that may be true, but you have to be careful. In my (temporally and economically challenged—cough) family, if we spend the time, effort, and money for something that is going to be, say, an “extravaganza” or even two, I don’t want to have to trust someone on the Internet who is telling me to trust them that this is going to be an “extravaganza”. I want the real deal. I want to know that is true. I’m an unlicensed Internet doctor so this I can verify the truth of this definition. But, stop and think about those two strong and powerful words, “elaborate and spectacular”. That’s a tall order. And, in order to achieve something that “amazing”, as an Internet doctor I can enhance the definition, you have to have some kind of serious investment in it. Say, time—47 years, money—20,000 customers, and experience—rated among top shows in the nation. 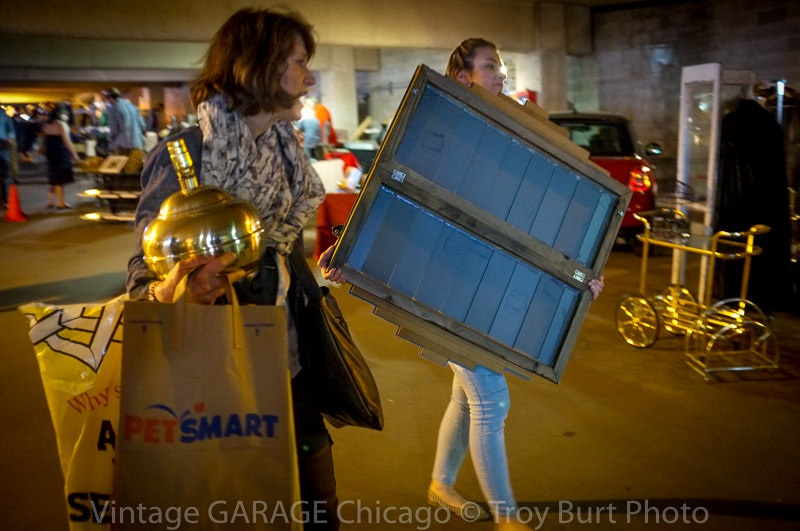 So, I’m beating around the bush here to make a point: The Springfield Antiques Show and Flea Market’s dual extravaganzas, meaning two, one in the spring and one in the fall, though both equally well attended in size, are what defines the term, “extravaganza”. In effect, they are real and they are spectacular! But, don’t take just my Internet doctor status word for it, let’s see how they actually measure up! Springfield as a top national show, is only in one space. 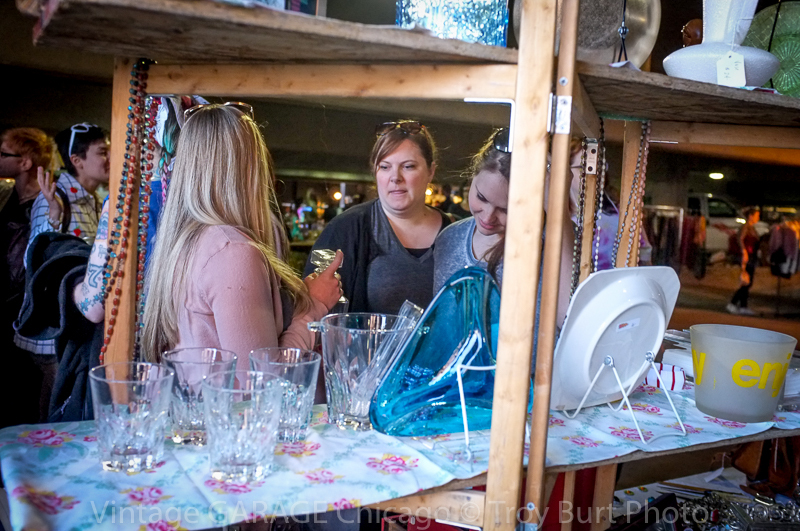 It’s not like Brimfield or Round Top (both amazing events), there’s no going between parks, towns, or spin off shows, sometimes up to twenty miles, but you as a customer can visit a similar number of quality vendors without all the hassle. Another thing that makes Springfield outstanding is it’s amazing buyability and range. We find and deliver all this amazing stuff, the vendors, do not forget you are dealing with intensely knowledgeable experts and truly amazing people. On the surface they may just be a handshake and smile, but some of these people are larger in ways you’d never expect, and you can only find them here! I mentioned history, but this is important and should be highlighted. The veteran promoters and vendors that make this show happen are on the front edge of what makes something like the “Extravaganza”, truly an extravaganza. They spend the whole year living the life it takes to know what sells and at what price. Do not underestimate what goes into this, they do it because their name is on it, it has to be the best, and it’s their life. There is literally a lifetime of history and experience that goes into this. I could elaborate all day on what makes this show truly spectacular, the details, food, people, fun, camping, etc. etc. but that’s all inherent in the word extravaganza. Because we call it that and you know what to expect, we all know. Just make sure to pass that on to a friend…which show to attend. 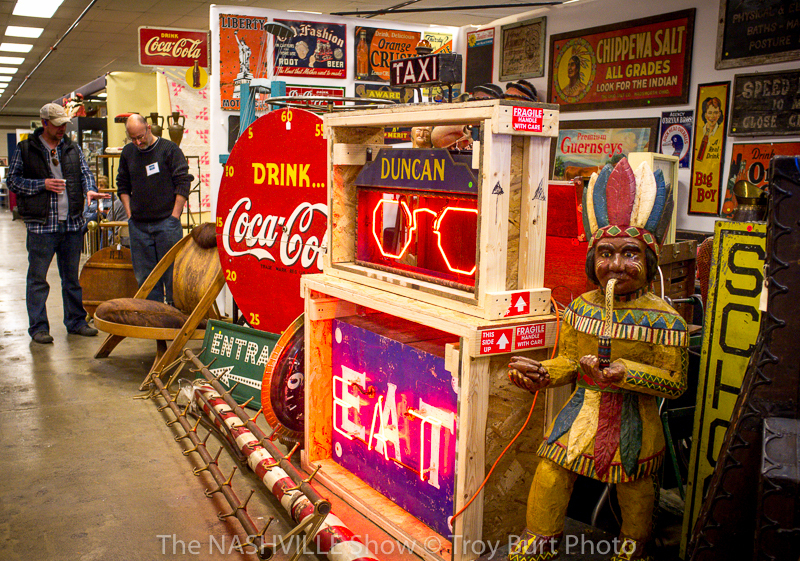 We are only weeks away from one of the greatest antique shows and flea markets in the nation. 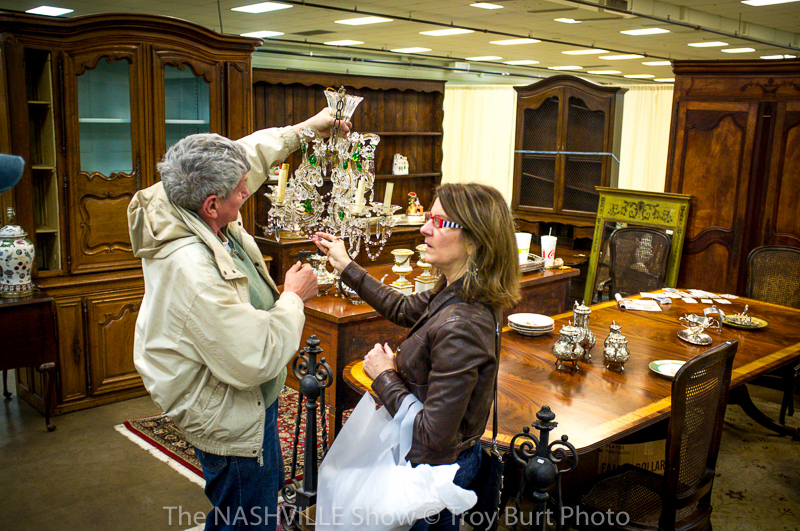 We hope to see you at the first of the “Springfield Antique Show and Flea Market Extravaganzas,” May 20-22. Remember, it’s going to be great, in effect, they are real and they are spectacular! 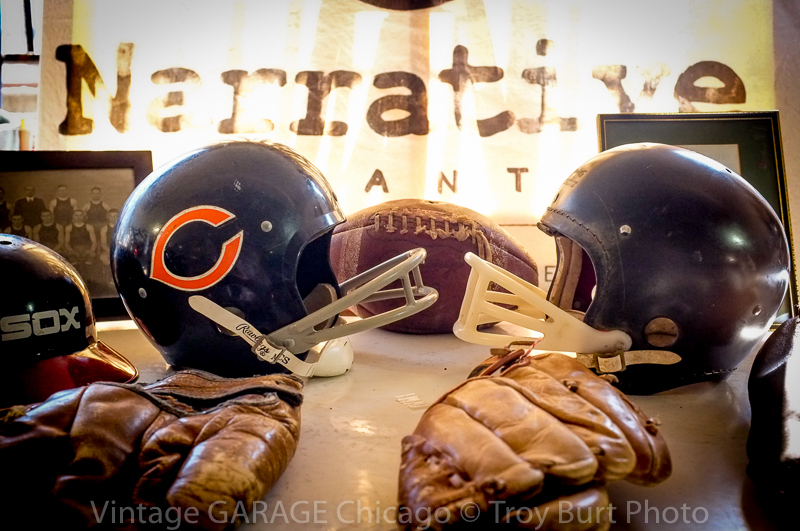 Vintage Garage Chicago, the greatest antiquing experience of my life in one of the greatest cities in the world, “Vintage Garage Chicago” actually in freaking Chicago! But wow—how do you just sit down and “write” anything like what happened? I mean how do I take my imaginary fake reporters contract and tell you what happened in a way you will want to read it? Hemingway probably did it better like a hundred times ago, first, right? Author’s note: the first draft of this was composed in the Starbucks across the street from the Chicago Tribune. I’m pretty sure at least three people thought I was some freaked out freelance reporter smoking late behind a deadline and was ready to snap anytime. We don’t get fancy coffee in Kantuckee I mean Kokomo, Indiana. 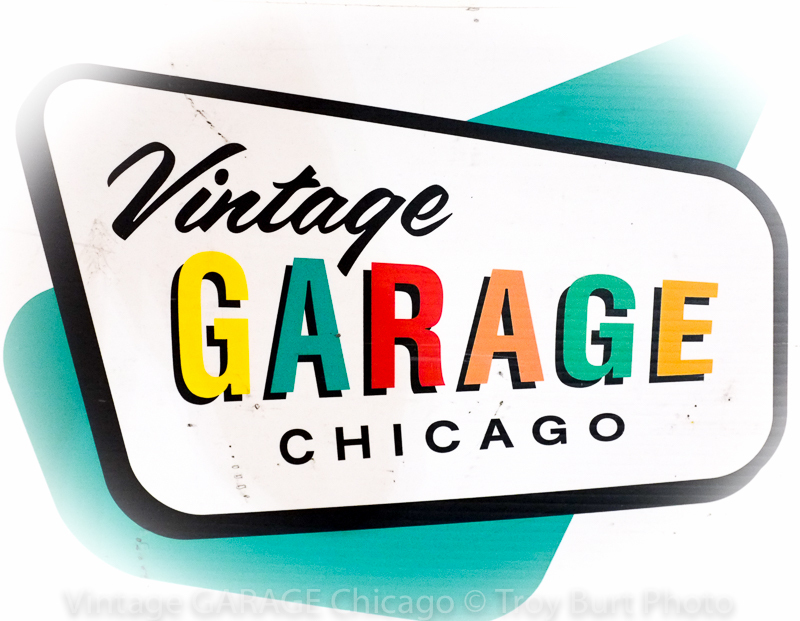 Jon had asked us to join him to experience Vintage Garage Chicago, fundamentally, for professional reasons, but to also recruit vendors and for me to review the show for the Springfield Antique Show & Flea Market and Indie Arts & Vintage Marketplace organizations. Jon was the veteran promoter, Troy photographer, and me the staff reporter. IAVM marketing and management attending a—eh professional development conference, of sorts. It was only a matter of hours and the three of us were on our way to this strange and amazing land of “Chicago”. We had to cross what I am almost certain was an ocean or something! 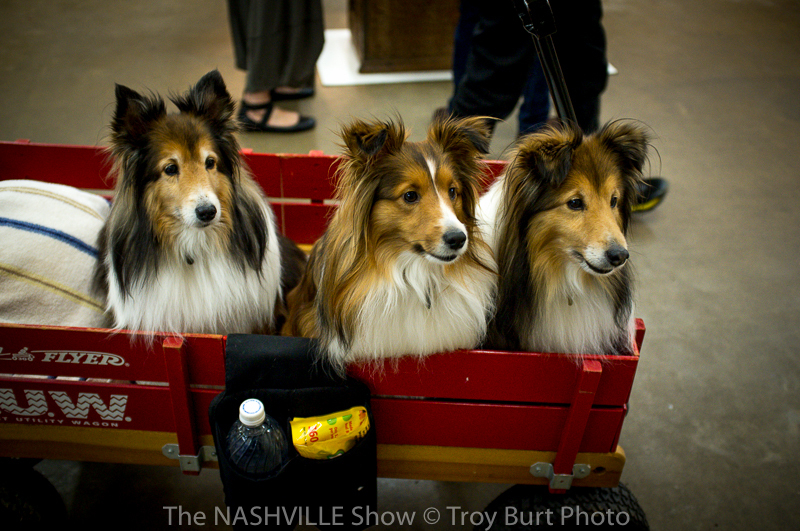 Troy took some amazing photos and for the most part you look at those and go, “Wow! Troy’s an amazing photographer and that’s some amazing stuff in those amazing photos Troy took.” I get what happened there! You might even say, “Those beautiful people look like they are having a fabulous time in Troy’s amazing photographs!” And they are! His photos truly tell the whole story. So, instead of going blah, blah, blah, this was a great show, my plan here is to capture the experience from a lowly and somewhat gross male laden “Hoosier” viewpoint, and by gross, I mean my inability to communicate coherently or effectively to anyone outside of Indiana in any meaningful way. I’m not ambidextrous I only speak Hoosier. And, I say this because that the whole of this experience, including all that happened in Chicago blew my poor, feeble, Wabash River soaked mind. I feel by sharing with you the whole of my experience as a simpleton and using hyperbole you will want to leap off your television riddled couch and come to this event! Plus, I don’t want to compete with Troy. 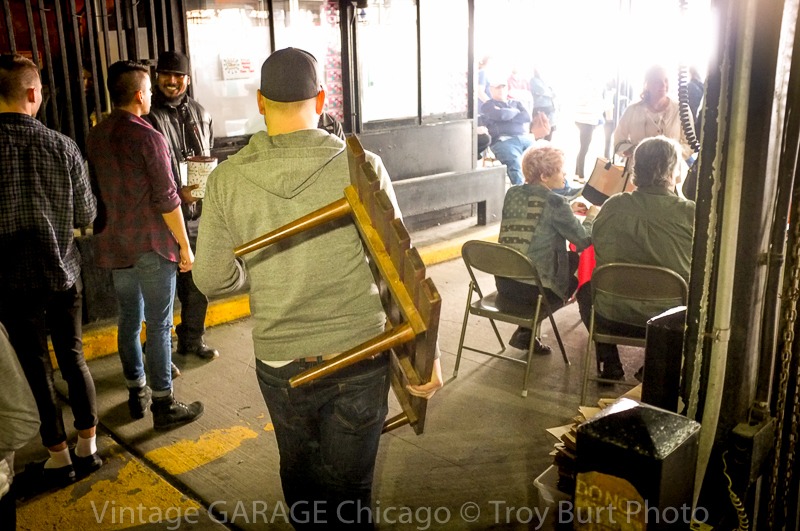 The photo above is the mighty Melissa Sands, founder, promoter (super awesome nicest person) of the Vintage Garage Chicago. From my perspective, though I am tall, I look up to her knowledge and experience. She has her powerful, amazing finger on the very thing that makes a show of this caliber so wonderful. I inherently bowed and scraped as I backed away. Could you imagine what it takes to make a show like this happen? Probably magic. JS. To fulfill the terms of the pretend reporter status in my fictional agreement, I must say now, without a doubt, last weekend was one of the greatest vintage and antiques shows ever in my life. In my professional opinion, if you missed it, I’m not saying you’re bad or wrong, you’re probably amazing and beautiful. But you’re probably also making less than great life choices and you can only make up for it by attending the next one, and here’s why. All this cool amazing stuff—you will (have) love(d) it! Side note, I had no idea both major oceans didn’t, in fact, border Indiana and there was, in fact, another place that actually outweighed Indiana in terms of the cool factor. If you don’t know Melissa or have never attended one of her shows as a customer or vendor, do yourself a big ole solid and jump on this. I couldn’t believe the quality of vendors and the great prices on stuff. All of us spent money and would have spent more if we had a larger car. We can take my much larger truck next time. 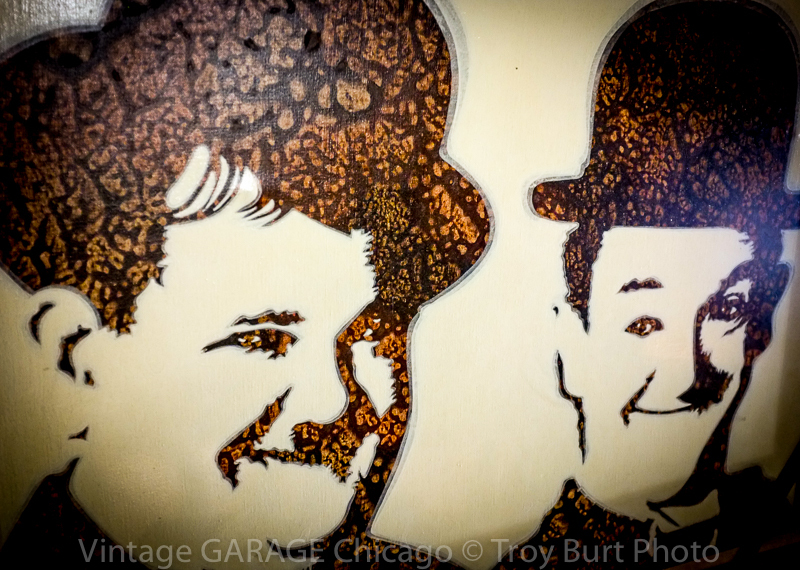 What I saw at Vintage Garage Chicago was by far inspiring. 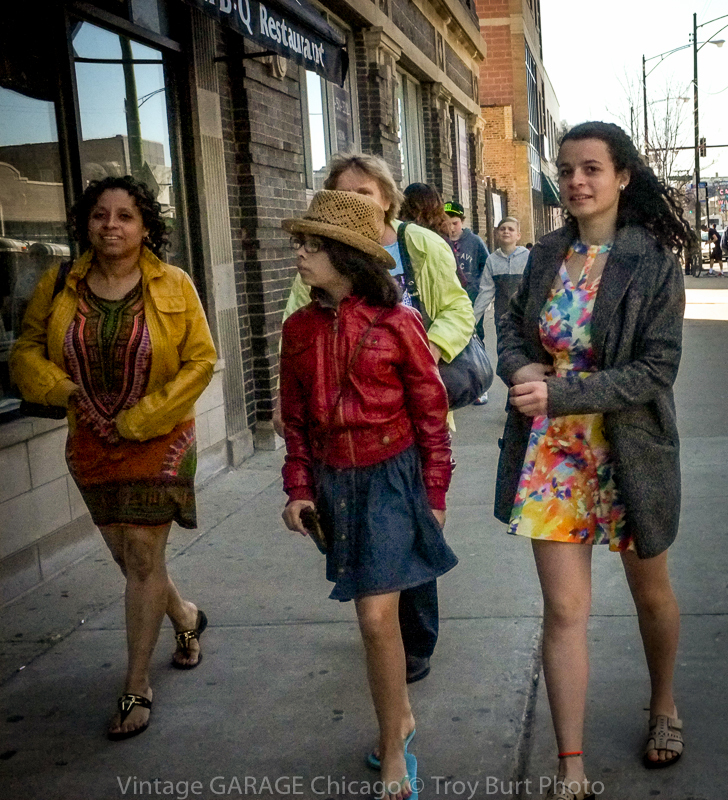 It was every bit of Chicago as I romanticized it always being. Including the Cubs winning. Who cares if the friggin’ “Rockies” won. What’s a “Colorado” anyway, Uncle Mike? And, while this may sound like three middle aged men using “professional development” as a means to escape reality and absorb Chicago for three long days…well, I guess that’s probably what it was, but we were working and getting a fill of what’s new, fun, and what people are buying in the cutting edge world of vintage and antique design and decor. Specifically, to ensure that every time one of you fine Hoosier or Buckeye folk attend an IAVM or Springfield event you are getting only the best. You see it as magic, but this is how we do it. 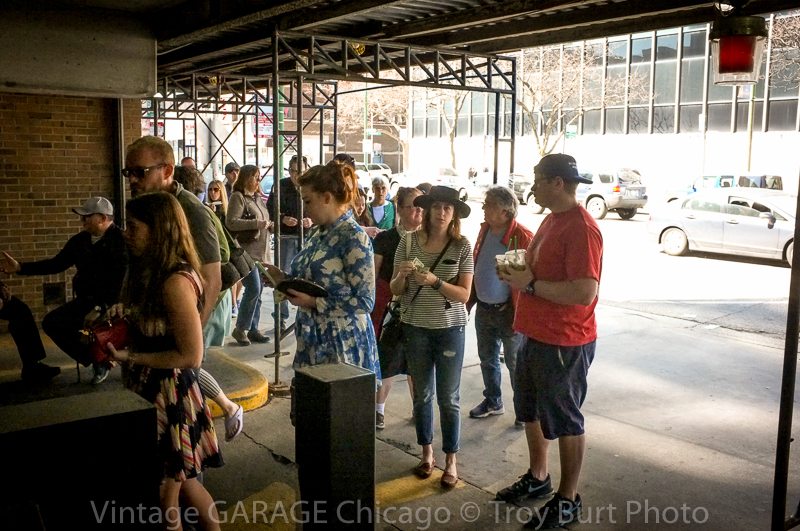 Overall attendance at Vintage Garage Chicago was awesome, and let me say now since I’m out of the range of Jon hearing this, the attendance was most impressive. I was both impressed and whatever the opposite of not at all seriously super impressed is. Imagine city of Chicago, no parking, people riding the train, but everyone was buying and carrying away merchandise both big and small. Melissa was doing something right and we saw it. Jon and Melissa joked that Jon no longer holds the highest attendance record. Which, may be true, she’s a frickin powerful woman and ha-ha to you Jon, challenge made! Our business is about inspiration. We live in a world where our happiness (and income) relies on knowing all about cutting edge design and what’s new. What makes the three of us individually and together good at what we do is we know what you want, at least the guy’s interpretation of it and even sometimes the gals. That’s mainly Troy. But, we also know that you always have to grow, learn, evaluate and grow your business and change to the customer’s needs. And, not to toot our huge male horns, but Troy lived in Chicago for twenty years and became the photographer he is today via the culture and design mecca that is Chicago. He trained and worked with some of the brightest and most talented names in the industry, and! Some of these folks were still around and some of these folks, including powerful women, own awesome freaking restaurants. We dined at several with awesome food, design, décor, etc. and he totally got us the “insider” treatment. This is the part where I tell you about my lesson in culture. First night, our host and co-owner, Sarah (powerful woman) of the Summer House paraded us to the very heart of the restaurant starting with a dramatic “around the hostess booth”, eyes turned, I think I told the host I was a professional golfer, to an area that seemed intentionally placed. I have nothing but praise for the Summer House and offer my deepest and sincerest thanks for having us, from the bottom of my heart, I thank you. I felt like I was in Chicago in my dreams. Second day, following that first amazing night, a morning, another Troy connection, our host, the mighty and powerful, Annie Jo, had just responded to Jon’s offhand comment with an “Office” quote that had us rolling. We were already having an amazing time, I remember pausing and thinking to myself, every angle here is worth noting. “Troy’s Friend” experience, again at the “Uncommon Ground” where I again was the professional golfer, was fantastic. Like everything up to this point. We were covering a show but we were truly becoming inspired. Morale was at an all-time high and it was never low before. Troy’s art still hung over the fireplace, we got a super informative behind the scenes tour of the overall operation, I think I pretty much know everything about everything now. The owner Michael was an outstanding host! The beauty of the place struck me. I felt connected to it. And it to the whole of the weekend beyond that moment. This is being, I thought, this represents what we do. This is our passion. What we, Melissa, Jon, Sarah, Michael, all of us do and it makes us intensely connected to it, vendors and customers all. It’s all built on many things, all of which we are deeply passionate about. We don’t feel like we are working, though we are working harder than we ever have in our lives. We are using all that we might have put into something else to create real and true enjoyment. When you, as a customer, patronize this event, these places, it’s not at all like we have to drag you there, is it? You come in piles because you get this—what this thing of ours really is. It’s a good thing and it represents love. 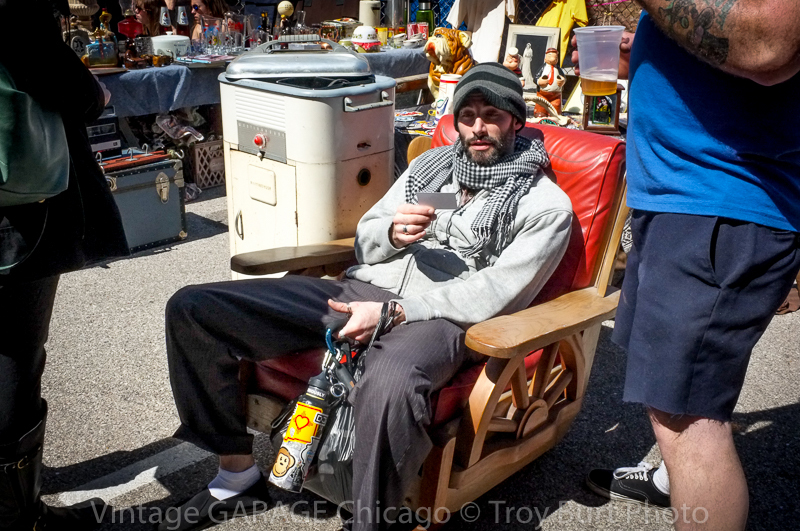 I saw lots of midcentury modern at this show, Troy actually made us haul home a MC chair! It was lovely, Troy. He wanted the red one too, but it was too big and I hope this guy bought it. 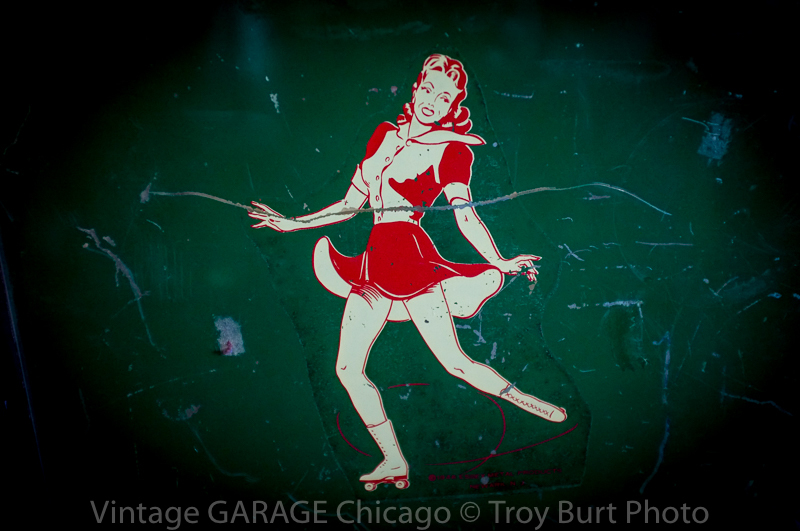 Today as I write this it also happens to be Troy’s (XXst) birthday, so I offer a gracious and selfless portion of his endearing art, more pictures, photos, and images of the Vintage Garage Chicago as a salute en description’! Dude hooked us up! Thanks man! Happy birthday! Overall, this was a swell event hosted by the best people in the world in the greatest city in the world next to the greatest state of Indiana! Everyone we encountered and met even the disagreeable hotel folks were awesome! The food and hospitality was great, almost “Hoosier”, again thank you Summer House and Uncommon Ground! And, a big Indiana thanks Melissa Sands for everything! We appreciate you having us. It was an amazing great show! 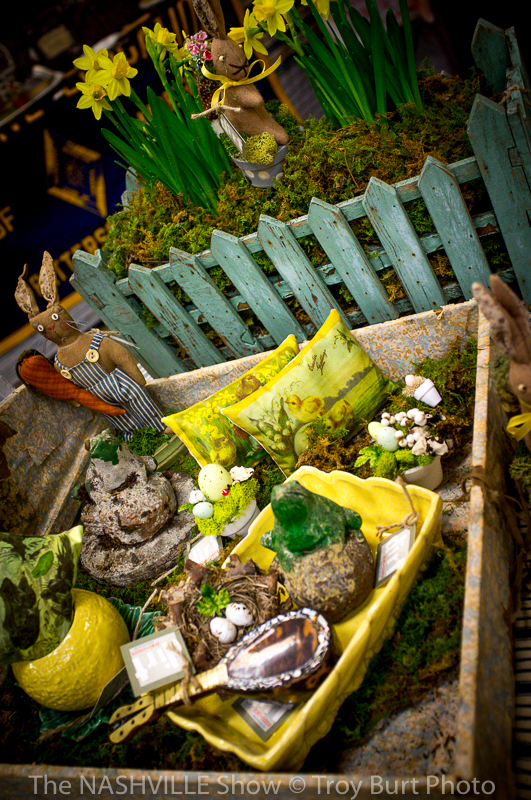 This weekend is the outdoor season opener at the Springfield Antique Show & Flea Market! 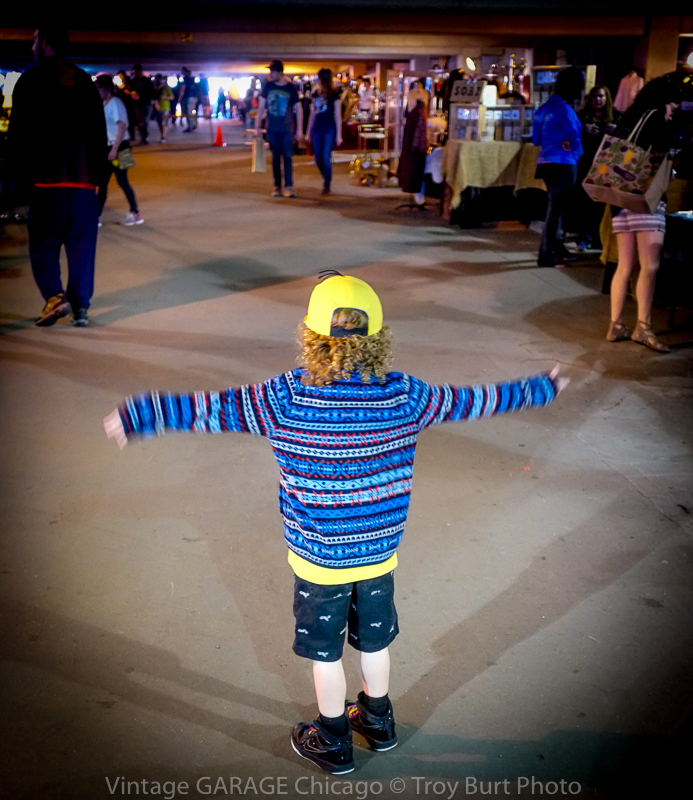 Are you ready for flip flops, cargo shorts, and armloads of unsurpassable quality antiques, artisan wares, and super cool vintage items? If you are, good! Because we are proud to announce this weekend is THE seasonal grand opening of the outdoor/indoor Springfield Antique Show and Flea Market! 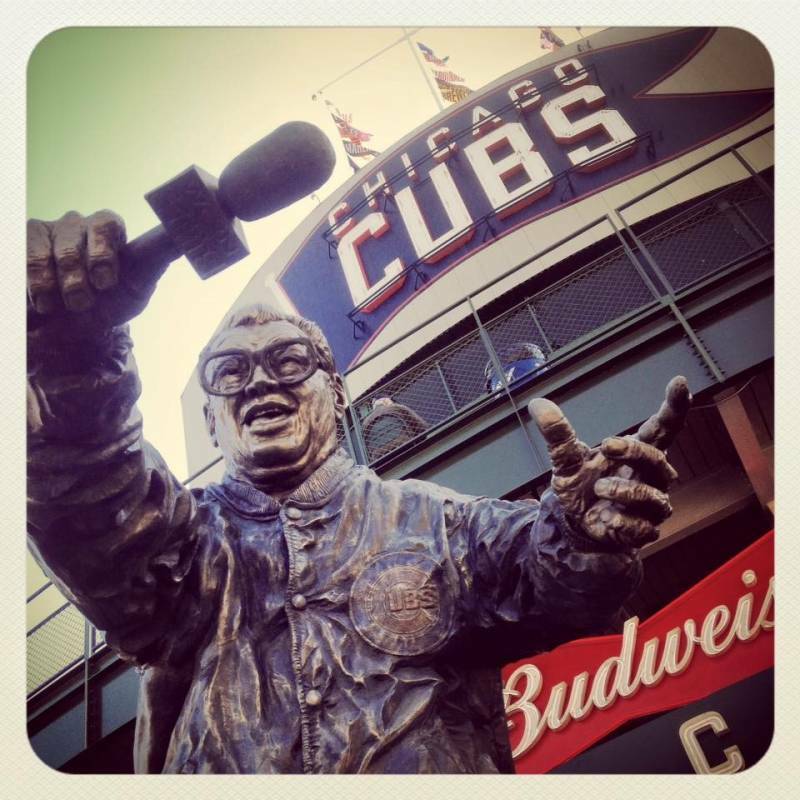 And, once again, this is going to be “one of America’s best” event experiences ever! The weather is going to be fantastic so come join us and see what our hundreds of vendors have been storing all winter to finally share with you! If you want the best new old stuff and great—super deals, this opening weekend is most definitely the one to attend! The doors open for the outdoor/indoor event Saturday April 16th and runs through Sunday April 17th. The outdoor/indoor event houses the antique show and flea market that features a huge variety of vendors and dealers from across the nation! 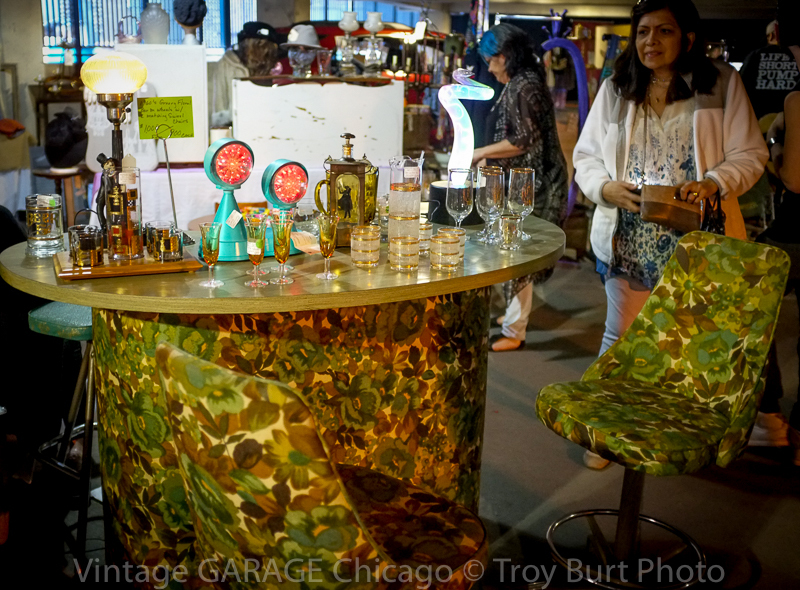 May 20th-22nd launches the first Extravaganza, which along with the outdoor/indoor event brings another host of top antique, vintage, and artisan dealers focused on design and fashion. This event adds a different flare and unique character that is something you have to see to truly experience! No one event is ever the same so you’ll want to be sure to mark your calendar and come to each one! Disclaimer: Our semi-legal almost experts advise us to advise you that unless you hate fun in the sun and super great deals on awesome antique and vintage stuff you should go to this weekend event! If you do hate that stuff, then you should probably still come and just enjoy the food, people, and other stuff that is likely there that may not necessarily be vintage or antique, like artisan wares or just generally cool stuff, but is still awesome stuff you will likely like. Either way, don’t be “that guy”! Come to the show and avoid being the featured image of our next disclaimer. If you’re coming from afar book your rooms in advance. This really is one hot event! Everyone I know that you know is going! Act now before it’s too late! Show hours are 8-5 on Saturday and 9-4 on Sunday at the Clark County Fairgrounds- 4401 S. Charleston Pike, Springfield, Ohio. Hope to see you there and stay cool! 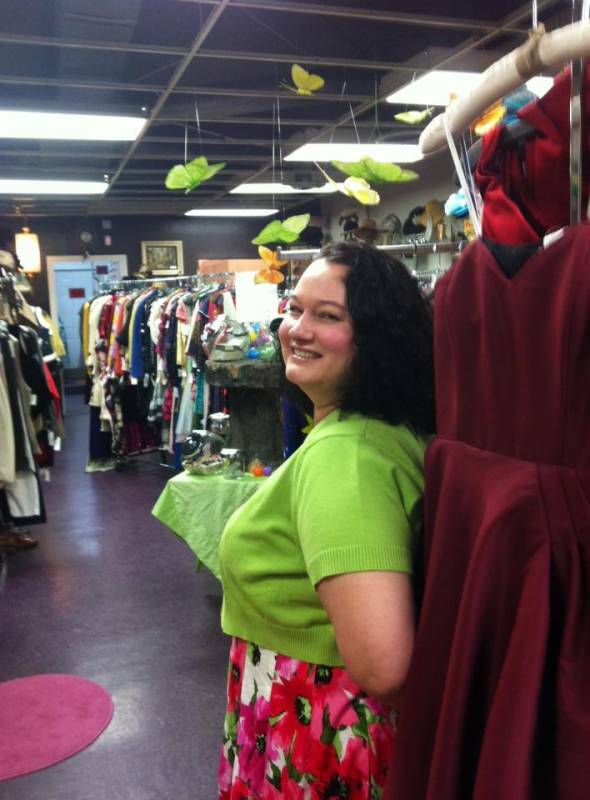 This year the Springfield, Ohio Antique Show and Flea Market celebrates it forty-seventh year. And to honor this historic and important milestone I have endeavored, as a historian, to retrace the rich history and determine just when and how, exactly a show this great came to be, so freaking great! After all, it is my job as a historian to fill those niches that history leaves open and it is with much shock and awe that I discover this important yet little unknown event and report it to you, the much deserving reader/customer. And, I say “little unknown” because the numerous references I have found in the historical record abound! Yet, it is only until now we, the historians, share them with you! Since the dawn of time man has endeavored greatness, and it is no wonder the Springfield, Ohio Antique Show and Flea Market has truly achieved that vaunted plateau. They have the exact formula down and it’s the perfect example of the American Dream. In fact, in this essay I intend to prove that history shows and that it has always shown that the Springfield, Ohio Antique Show and Flea Market has achieved and always maintained this ranking of ultimate greatness. Here and through the power of written word I will prove the Springfield, Ohio Antique Show and Flea Market is the most super-spectacular event ever to be showcased in the entire course of history-kind of this country, America, USA, of these United States. And, it is with these words, sometimes bigger and some more descriptive than others, that I uncover the hidden truths concerning the show and expose it’s raw and unconventional history. By what unimagined feats and struggles is has come to be the “canon” by which all other shows look to? But, more importantly, I do it to prove to you, the reader, that you should follow suit and attend this show! The first hit was a free Google book written by Founding Father, Thomas Jefferson, on the influence the Springfield, Ohio Antique Show and Flea Market had on forming of the then fledging nation. I have to stop here and mention that as a historian and a true American I am somewhat biased in my goal here. I mean, who wouldn’t want to prove that the Springfield, Ohio Antique Show and Flea Market has literally come to define all that is the world and more. And, as an objective historian who bases his research on evidence, I can’t help but be overwhelmed by this bias. So, It’s important I state it. I will now lend to another supporting method, participant observation, to interview an existing entity who witnessed the full existence and actual impact of the Springfield, Ohio Antique Show and Flea Market. Who none better than the Bubonic Plague to tell the full power of this truth! Thank you for taking the time out of your extinction to join us today. And, let me just say, I understand how sensitive of an issue this is and at any time if you want to stop, that is fine. But also remember the good you do in telling us this and the importance your words and contributions will have on the world. You are most welcome. And, let me just say, as a plague, I hold no grudges and totally understand the importance here. Historian: Whew, that makes me feel much better. I certainly don’t need no plague! But, let me turn the table back to you. I can tell you are coming to terms with this and as a social scientist I think you need to, for yourself and for healing of course. Thank you for that, and you are right. It is time for me to address this and get it off my chest, no pun intended. If you don’t mind, I would like at start at the beginning. 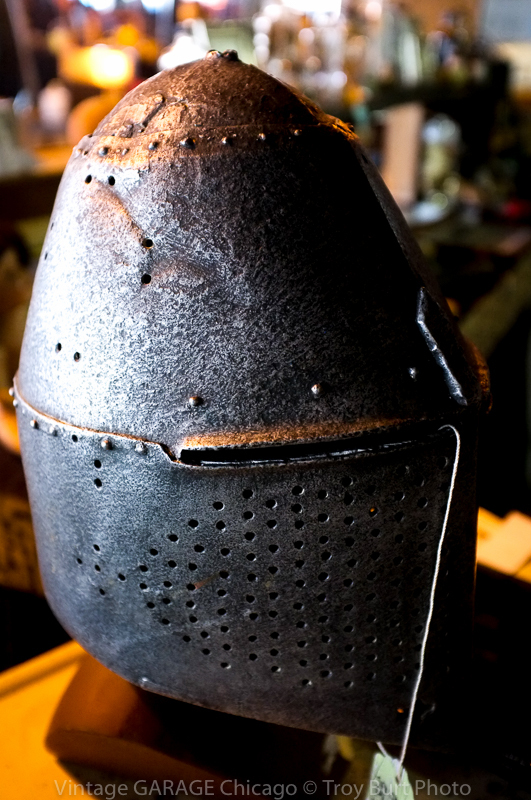 It was a cold night in 1492 and to warm things up I had been breaking in the new Bryan Adams album. Man, that one song, Summer of 69, whew, my spirits were way lifted. It was then I heard a knock at the door. I went to open it, slowly and with great hesitation, note I rarely, I mean rarely get visitors, I mean I’m the frickin bubonic plague! So, I was already racked with trepidation, regardless I opened and immediately realized my mistake. It was a commoner with a flyer for the first ever Springfield, Ohio Antique Show and Flea Market. Wow, you actually saw the first flyer? Amazing! Yes, but I should have ripped it into a million pieces. But, I couldn’t. See, I was hooked myself. I mean, did you see those double-sided antique porcelain gas and oil signs? Who sells gas and oil signs for twenty-five bucks? Again, I should have shut the door then and there and went back to my plan to infect the America’s, but I didn’t. In fact, I never did—anything again, except go to that blasted show! It’s okay Bubonic Plague. You don’t have to continue. Here’s a tissue, and a lung. Bubonic Plague: Thank you. I love that we can 3-D print those things…I mean hate. Arggg! Sorry, I’m just so confused. Anyway, where was I. Oh yes, the signs. I was hooked. I went to that first show and never came back. It was over for me. People tried to say “washing your hands” was what killed me. But, it wasn’t. 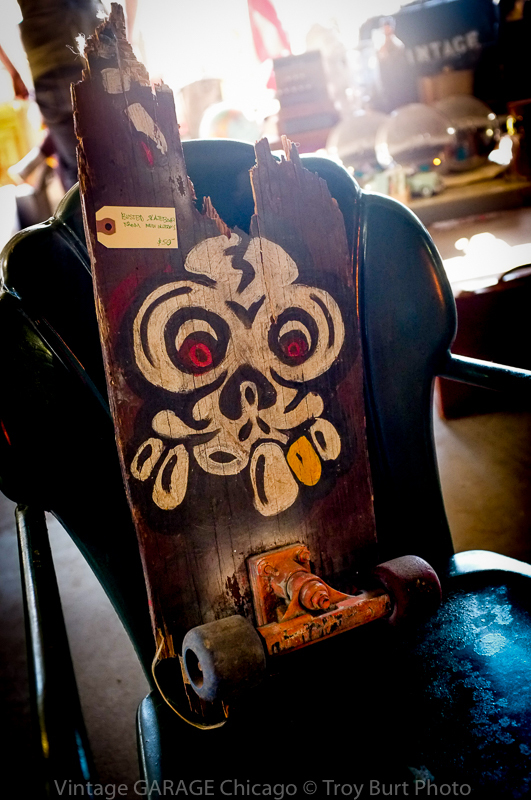 It was all that killer antique and vintage stuff at super killer prices, no pun intended. I realized there was more slaying going on there than I could ever even attempt to commit, and I just hung it up. *Whimpers* Sorry for crying. Every time I hear the phase, “Killer deal” I get all choked up. So, you actually attended the first Springfield, Ohio Antique Show and Flea Market in 1969? Wow! That was forty-seven years ago! I always knew you were well-aged (experienced and esteemed), but I would never have guessed this? Does AARP still cover you at that age? And, how do you still walk? Those are all fair and valuable questions. What keeps me going is every year I know the Springfield, Ohio Antique Show and Flea Market will be as amazing or better than the next. It’s that adrenaline that keeps me out of the gutters and away from the rats. I may have a few fleas on me, but isn’t that what a flea market is for?! Ha, ha, ha! You are too funny! But, you are correct! 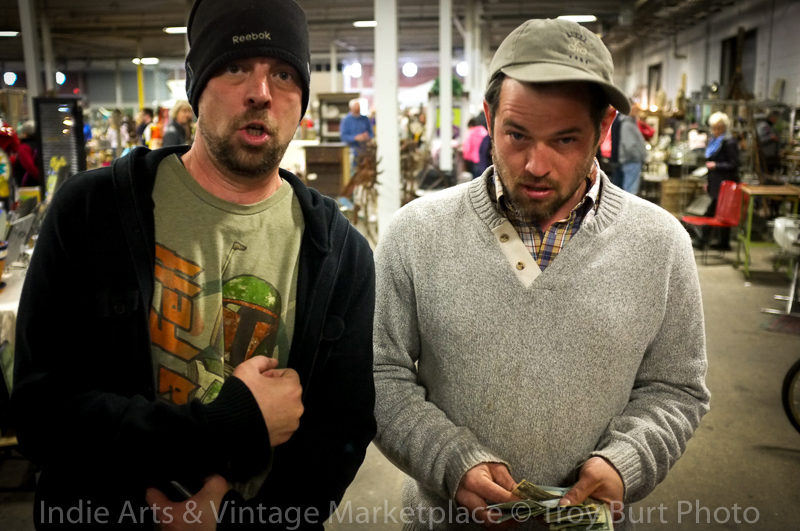 The Springfield, Ohio Antique Show and Flea Market is all about a good time! Thank you Bubonic Plague for taking the time out of your extinction to visit with me and I will make sure to close your lid tightly. How can you go wrong with an interview like that? I mean, if this isn’t supporting evidence, what is? But, because I’m being paid to make sure you truly believe, let me go back a little further and highlight others in history who sing the bubonic plagues praises. As a licensed mail in art class historian and self-anointed Internet doctor I have the science-given, natural expertise and authority given by Jon, to use almost-mostly factual, science-laden history to make this truth. Therefore, in conclusion, throughout history of human-kind woman, man, animals, strange transformer beast-like robots alike have endeavored to go, nay, to BE! 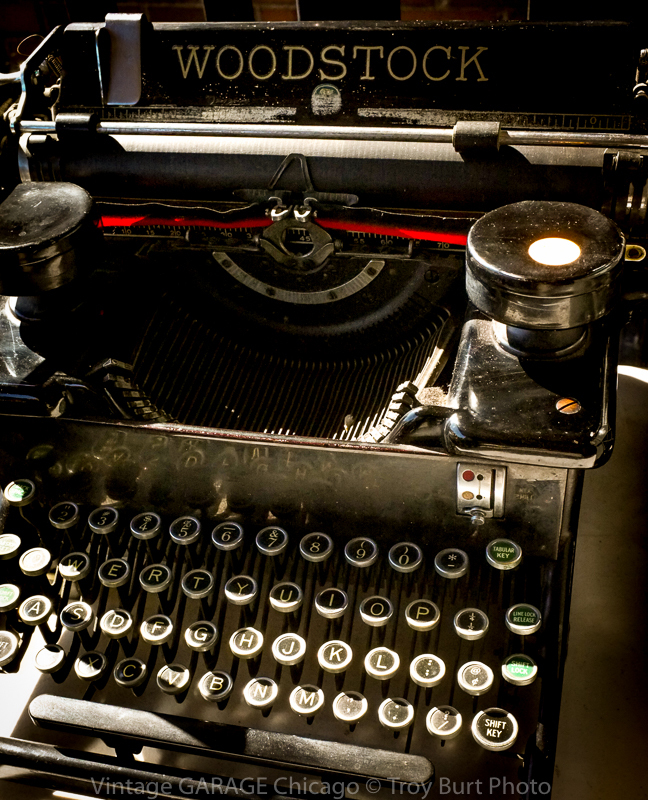 the legendary Springfield, Ohio Antique Show and Flea market! Fore score because it is the time tested Antique and Flea Market of all time! And, most importantly, it’s where all the quality and veteran vendors will be and where the best deals are! That power, that greatness and the lure of truer omnipotence that steadies it as this year’s premiere antique, vintage, flea market—ever, of our age and into the future will stand the test of time and prove once again, that it’s the reason to traverse, nay, TREK! To Springfield, Ohio this May 20-22 2016 (just days after we make first contact). It is also with great adieu that we reaffirm this year will be the extravaganza that rockets it into its forty-seventh year. That alone—the fact that this show has run forty-seven years should let you know they do it all for you. 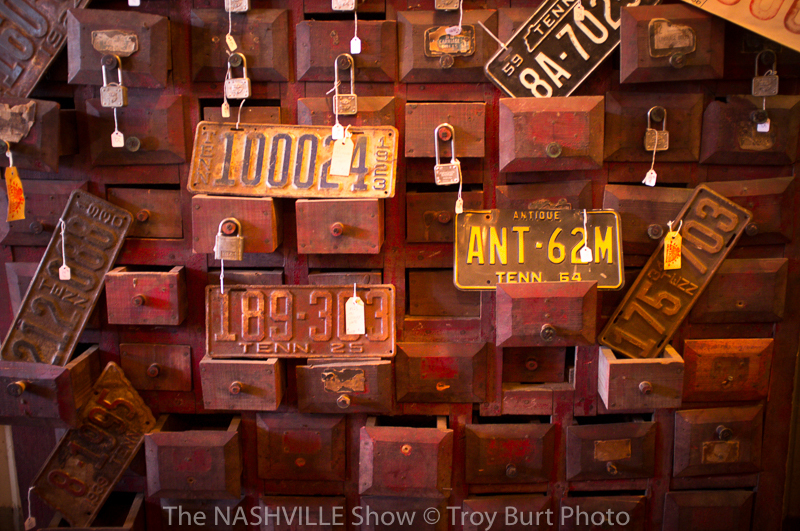 Located in the heart of antique country, Nashville, Tennessee, this year’s “The Nashville Show” lived up to its reputation as one of the top antique and design shows in the nation. Now celebrating over thirty years (and growing! Spread out over four large buildings! ), it’s no wonder the melding of a second show, a bold and daring move on the part of the veteran promoters, has become an extra anticipated and welcome feature. 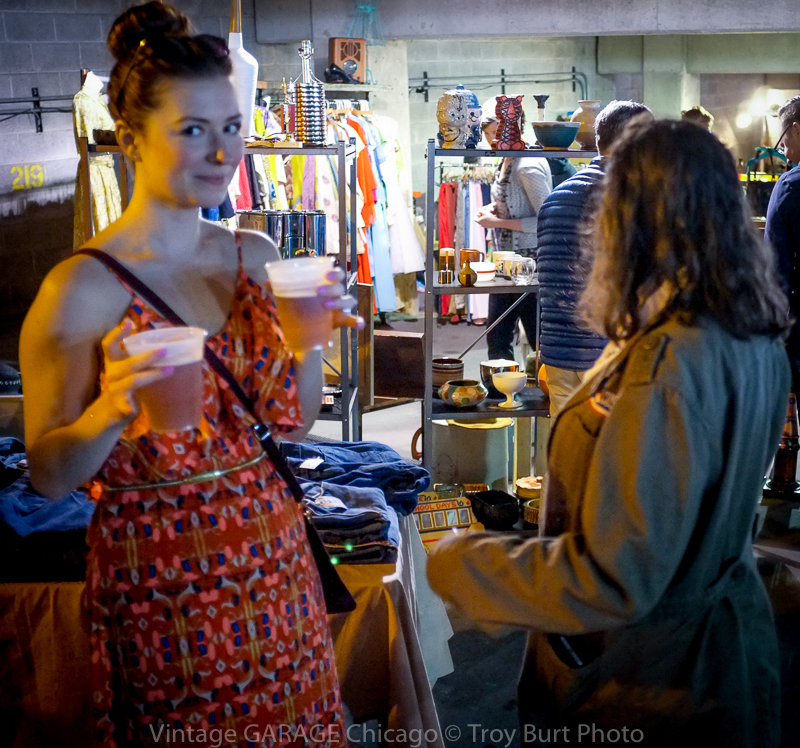 Celebrating its forth year, The Vintage Marketplace is a fresh approach at the traditional classic antique market. 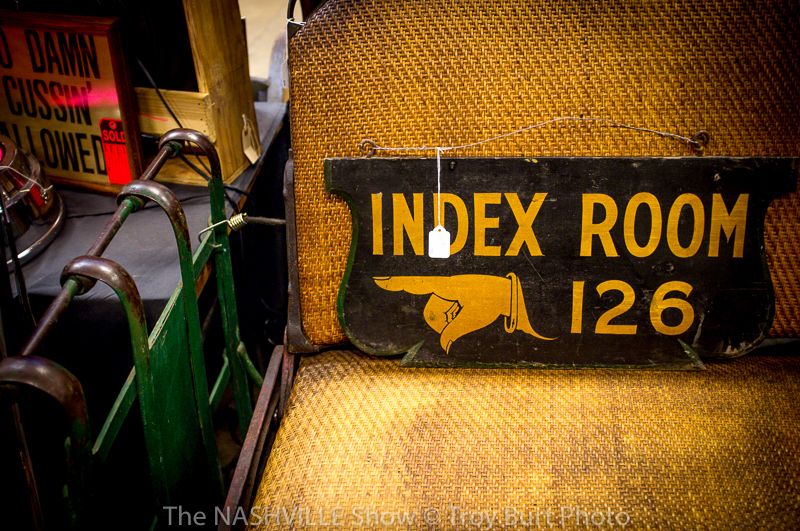 The Nashville Show has always featured top dealers from around the country who, because of the quality of their wares and overall appeal to trend and design have come to make the show the powerhouse it has become. 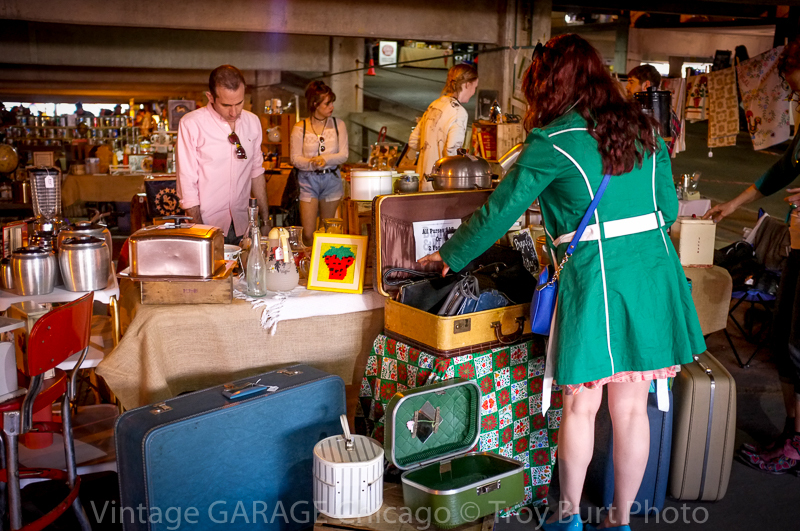 The Vintage Marketplace, while still offering a similar quality of dealers and wares, is full of excited, new, young faces who are more focused exclusively on trend, design, and décor. In an economy waning wants for needs, this welcome youthful exuberance also offers affordability, in my opinion, it’s what’s keeping the tradition of collecting and appreciating antiquities alive and well. 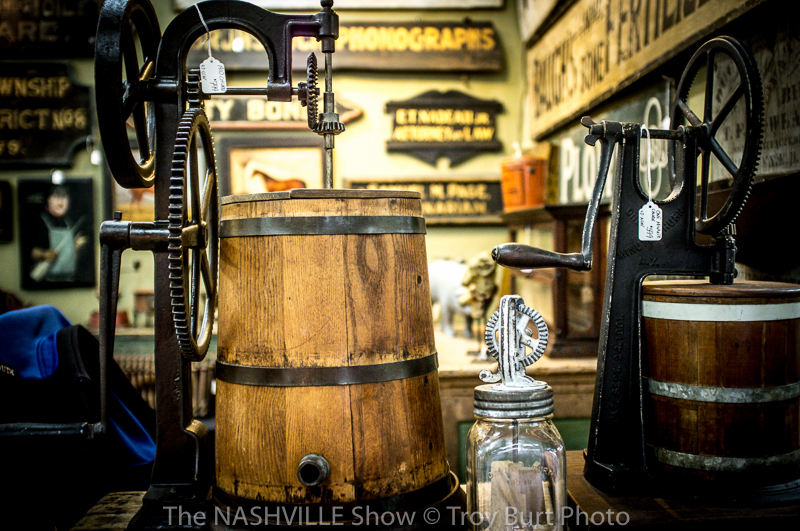 Much in the vein of the Indie Arts and Vintage Marketplace (Indiana), The Vintage Marketplace (Tennessee, same promoters) centers around artisans and “pickers” who focus on epic design trends that are sweeping the nation. 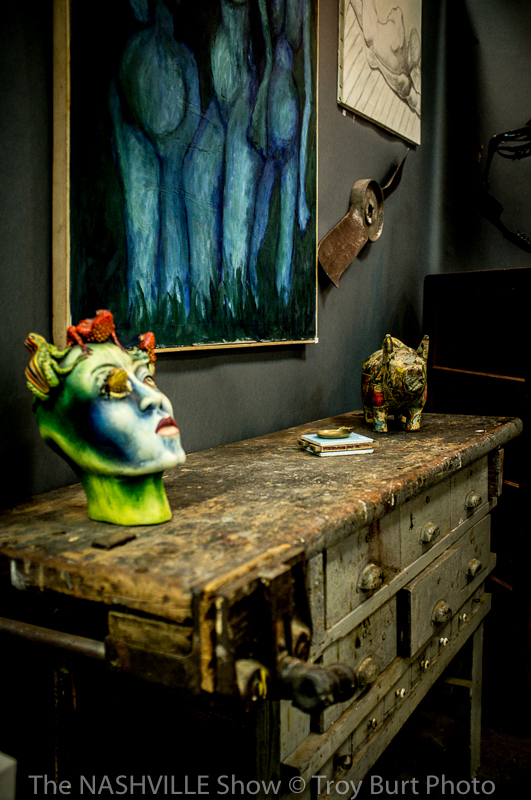 And, while you might expect this new show to be similar, in many ways it is, The Vintage Marketplace offers an environment where individual pieces are showcased almost like art in a gallery. For example, the photo below highlights space and design around a featured piece, framing it within the greater exhibit. I like to call these “experience pieces”. I should note The Nashville Show uses this approach as well, this is where the concept was born. 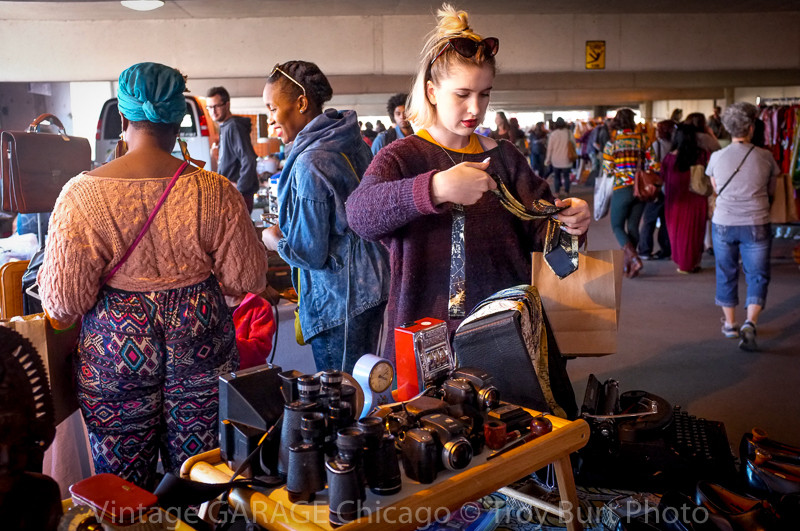 And, while I will intermingle the photos between the two markets, I will relate or discuss the nuances behind this method within the context of The Vintage Marketplace as a means of attracting new people! The dealers place each item, as I like to call it, on their canvas, like they are staging art. Note, the background color, the dealers intentionally choose that color. Every inch of the way planning and forethought go into this. Look at how the light green accents beautifully—perfectly the browns of the finely aged wood and banded grey and black iron. It peaks at me saying, “I feel rustic, ready to churn something”. It’s a living moment. 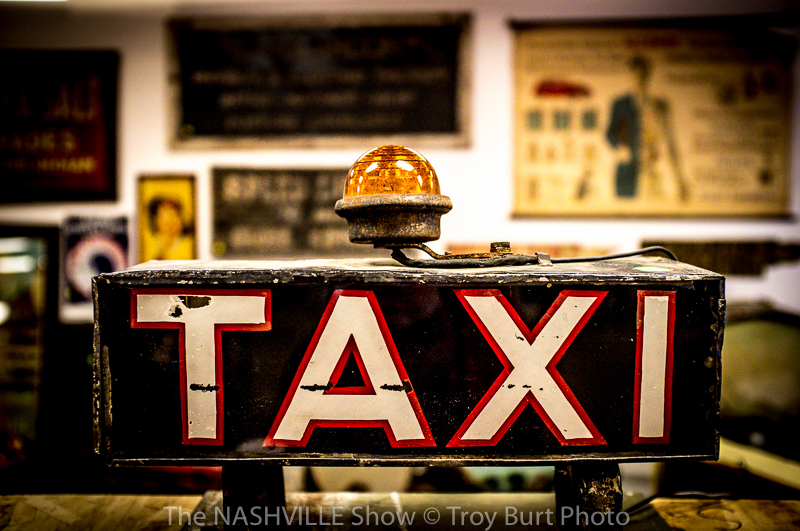 This photo comes from the Nashville Show, which tends to feature more antiques. Here’s another example. I want to buy that whole slice, yellow and all! Don’t even need parmesan and crushed red pepper! Your friendly neighborhood event photographer, Troy Burt, (he can photograph tall buildings in bounds!) intentionally photographed these images this way, in fact, we discussed this very concept early on so that we could present it as driving feature. Let me just say, these images are coming to you in order of how Troy and I first experienced the event. I wanted to write a review that was heart felt, an experience that you could relate to, and I wanted to capture first impressions. I note this framing and color concept, because it was so present and breath-taking, it was the first thing I noticed and almost couldn’t get away from it. In this next run of photos, I will jump to some of the best finds in terms of cool factor, price, and overall something or another. I will be crossing markets, but I will highlight each and tell you where these items were found. After a several of these you’ll start to catch on to how the two markets interact. Note too, use your eye along the way to study the intentionality (actual word) of placement and color. Enjoy this review like you would the show. Savor it, the images are wonderful and worth the study. Note too, these vendors tend to tour with the promoter, look for upcoming events (possibly near you) if you like something you see. Overall, from here out, I’ll just say I’m going to show you what you missed! 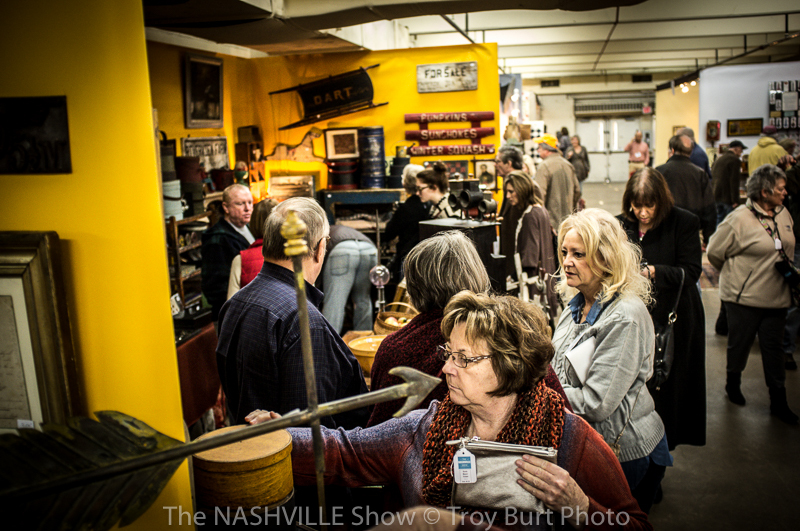 Nashville Show side, Sandi St. Pierre from Maine had great stuff and great deals. 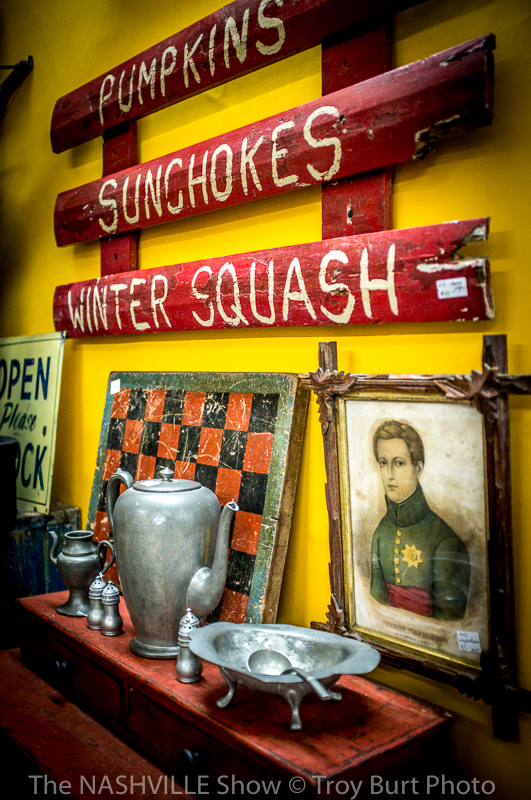 The bright yellow was a real eye catcher, I heard a few people comment, “It’s the lady with the bright yellow background!” She offered a variety of early antiques, primitives, and collectibles at great prices! The ability to shop under such circumstances is not, but suddenly is, on my bucket list (under the auspices of Mike Tyson!) Jonathan offers such a well thought out, diverse, quality of wares I almost don’t know where to begin. 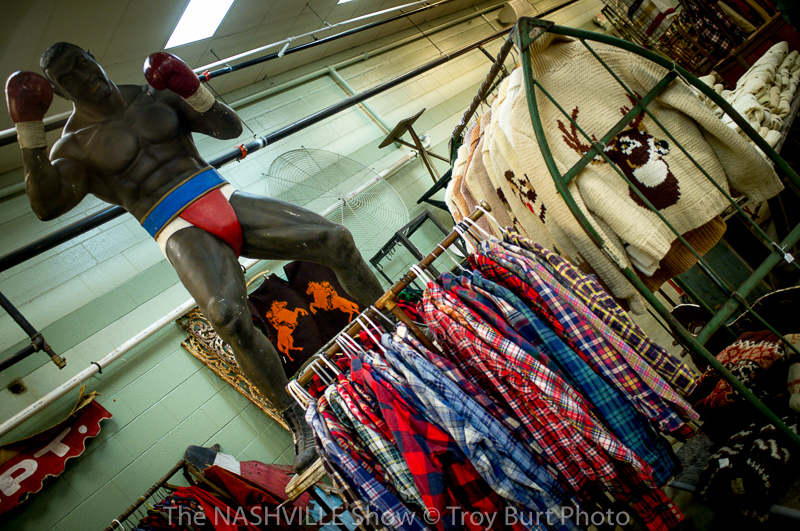 This is most definitely The Vintage Marketplace and highlights perfectly the range of options at the Nashville Show! Just going to leave that one right there! Next! The Hallett’s from Tennessee doing business and making life easy for customers. We saw that everywhere, lots of buying and smiling! Troy and I had our eye on that head/bust all day…wonder what happened to it? I cannot stress enough how great the stuff is that Don Orwid brings to these events, or any event for that matter. 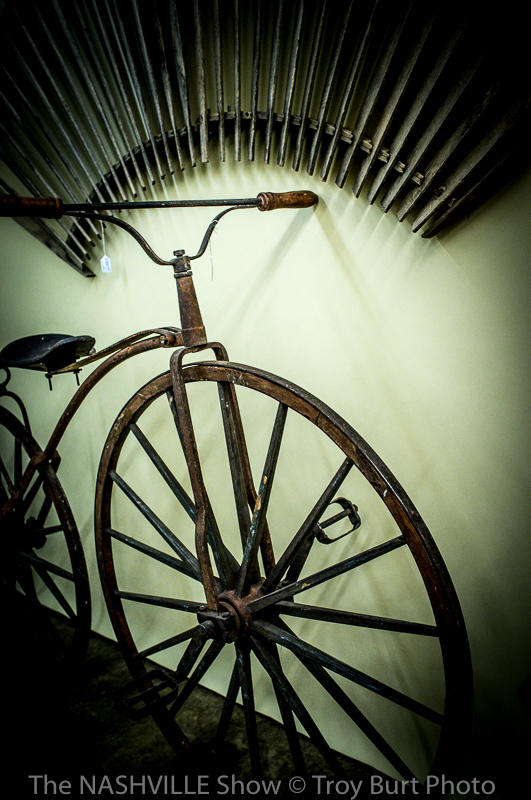 This mid 1800’s “Bone Shaker” is what dreams are made of—typical Don! I never in my life thought I would see one in person. If there was one reason to come to this event, at least for me, it was to see and touch this beauty! Symmetry, color, bold and unyielding potential in any design combination, I heart license plates, chippy paint, and little drawers! Next year we’re renting a truck, Troy! 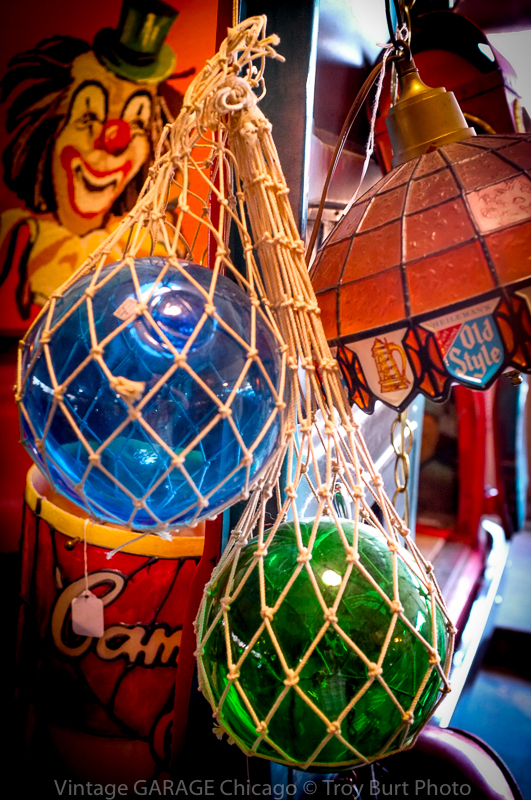 Again, this is The Vintage Marketplace, and while there’s a touch of antique and “collectible”, I call, décor—art! I think lots of people love this kind of thing and I hope one of you, beautiful, caring, and faithful readers acquired it! Good taste, indeed! Sorry about the undesirable…stage left, lucky I could get a guy of such caliber to listen to my ravings. 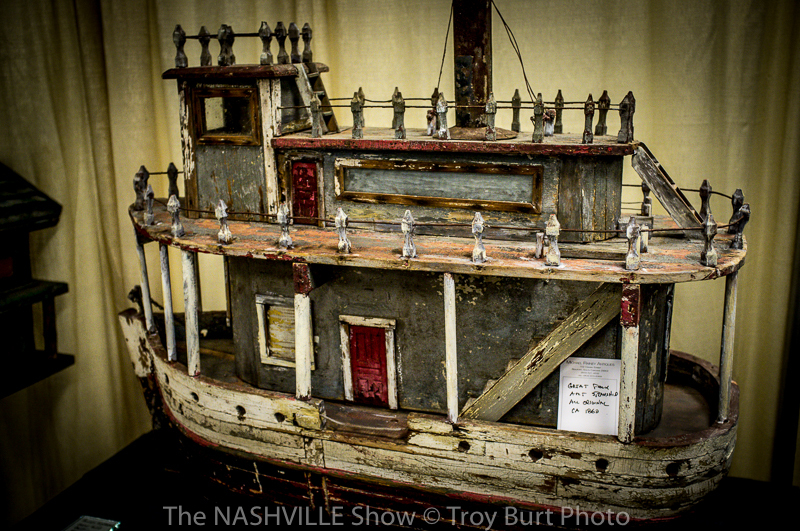 Bill has been a mainstay of the show circuit for years but was new to the Nashville Show and offers some of the most eye grabbing stuff, period. I was enamored by that chair…the kick drums *swoon*, and horseshoe display, the lights…I was like a moth to a flame. I kept finding myself in his booth! And, seriously, though, he’s one heck of a guy and as about as knowledgeable as they come. I had a real nice time chatting with him and learned a lot! He was actually wounded with a limp leg and he still stood up each time and talked to me when I visited. He’s what I like to call a “standup guy”…crickets. Thanks, Bill, we love your stuff! Index Room 126 is that way. Welcome! Cool no matter how you hold it. The whole family’s like, “Don’t get us like this!” Sorry folks, loved the moment! Great eye, great piece! Hope you had fun! A mix of modern and traditional, customers had a rich variety to choose from. There was something for everyone. I’m not sure exactly what that lady is holding (I break glass, try not to get too personal with it), but again, moth to a flame, bright and shiny. Every dealer had something that caught my eye! This was the Nashville Show side. Look! At! Those! Cabinets! And, of course everyone was thinking spring. Seventy degrees on a sunny Nashville day kind of does that to you. In fact, the whole nice weather, “Southern Hospitality” thing was a nice added bonus (I’m from Indiana, we have “Hoosier Hospitality”) and made the event in whole, that much more enjoyable. We’ll post more photos in future articles, and I hope by what I’ve shown and told you here is enough to catch your attention. The event was so big; it drew the likes of some pretty important people. 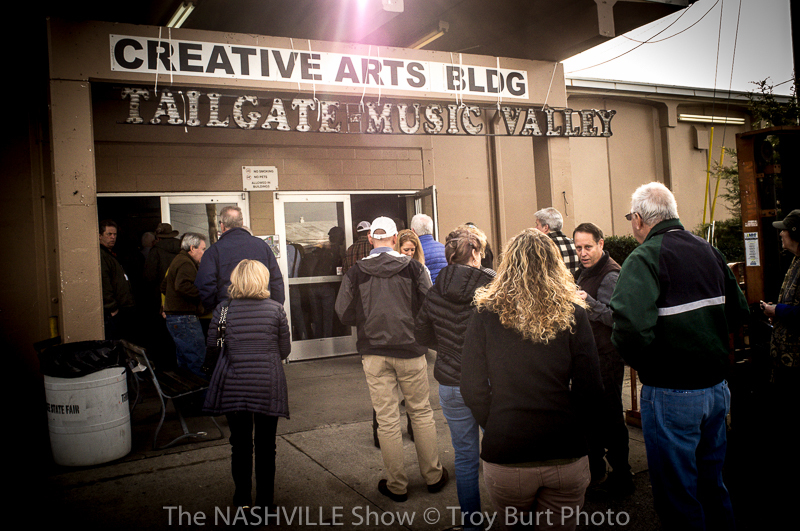 Keep an eye out for future articles that will include updated dealer info and news in general about the next Nashville show and for the Marketplace shows. And, I’ll always include new pics. Thanks to everyone who came out and all who were involved. It’s a tremendous effort to make this happen and kudos to all who helped. Can’t wait until next year!